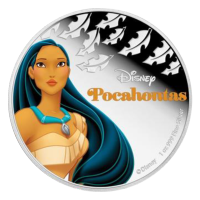 ظهر العملة صورة ملونة لبوكاهنتس مع اوراق الشجر محفورة في الخلفية وعبارة "Disney Pocahontas 1 oz 999 Fine Silver"
صورة ملونة لبوكاهنتس مع اوراق الشجر محفورة في الخلفية وعبارة "Disney Pocahontas 1 oz 999 Fine Silver"
1oz 2016 Disney Princess Pocahontas Silver Coin The Disney movie Pocahontas tells the story of a playful, free spirited young woman, featured on this beautiful colourized silver proof coin. Pocahontas was released in 1995 and was a huge commercial success, as well as the recipient of two Academy Awards. The movie is very loosely based on the 1607 landing of Captain John Smith and the establishment of Jamestown, and Pocahontas's interactions with the explorers. The obverse has the Ian Rank-Broadley effigy of Queen Elizabeth II, while the reverse features a colourized image of Pocahontas as she appeared in the Disney film. A perfect gift for Disney collectors or Princess fans, the limited mintage of 10000 should lend this coin enduring appeal.